Christmas is the best time of the year. Everyone puts on their beautiful outfits and decorates their houses to celebrate this great day. 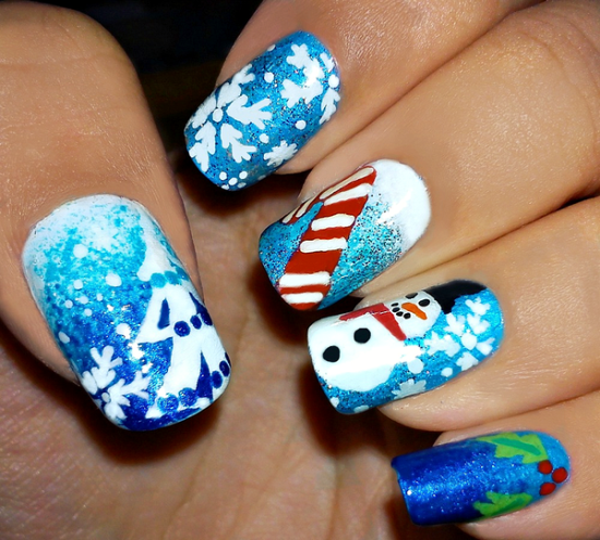 To make you look more perfect on this day, we have made this post about some fabulous Christmas nail designs. They will make your holiday more interesting. 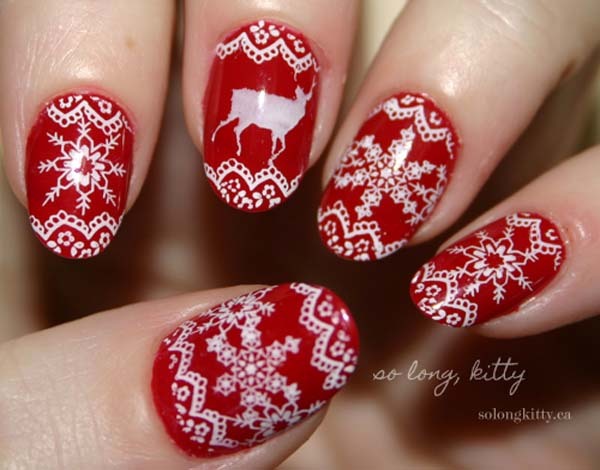 In addition, these stylish Christmas nails are very easy so you can make them at home. Now, just stay here and find your favorite nail design. 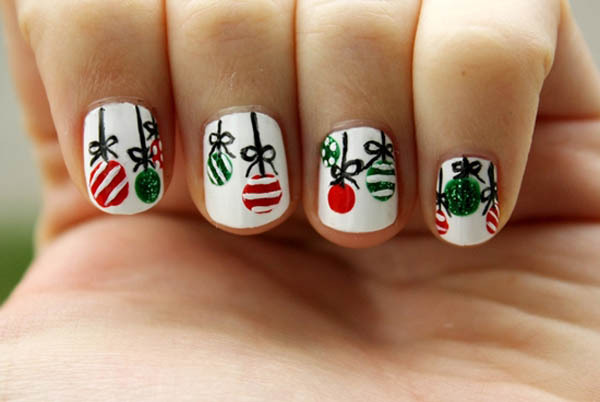 Enjoy your Christmas with chic Christmas nails. 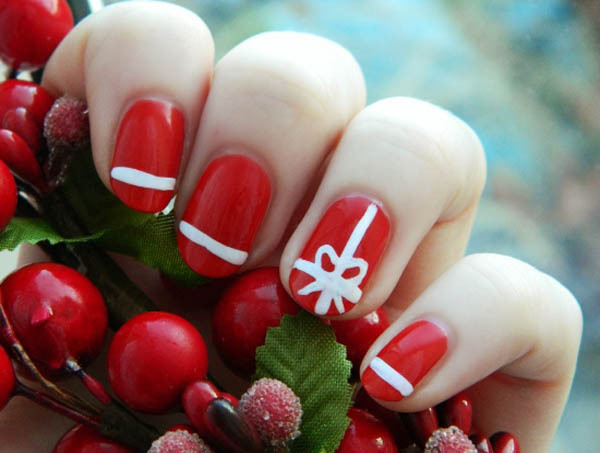 This is a very simple yet stylish Christmas nail desgin for all the beginners to try. Your nails become more festival with the red nail polish and cute white paintings. 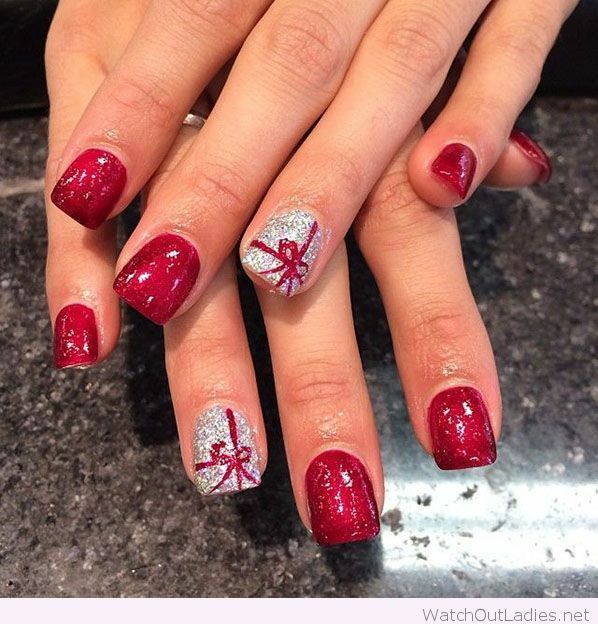 Your nails will look like a fancy gift on Christmas. Besides, this nail design is quite simple to make, too. And they will look great on all women. 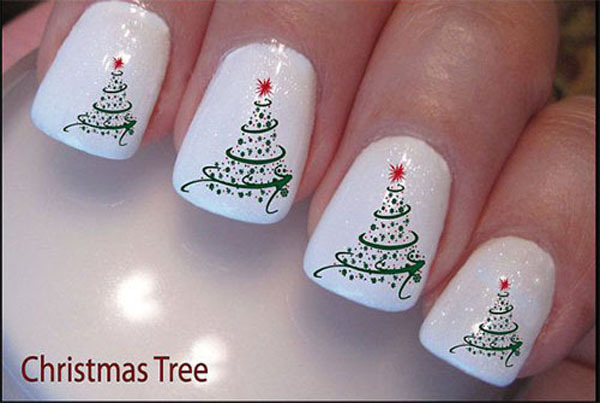 This fashionable nail design is inspried by the well-decorated Christmas tree. The stars and red dots add more fun to the nails and it’s quite chic for women to try. 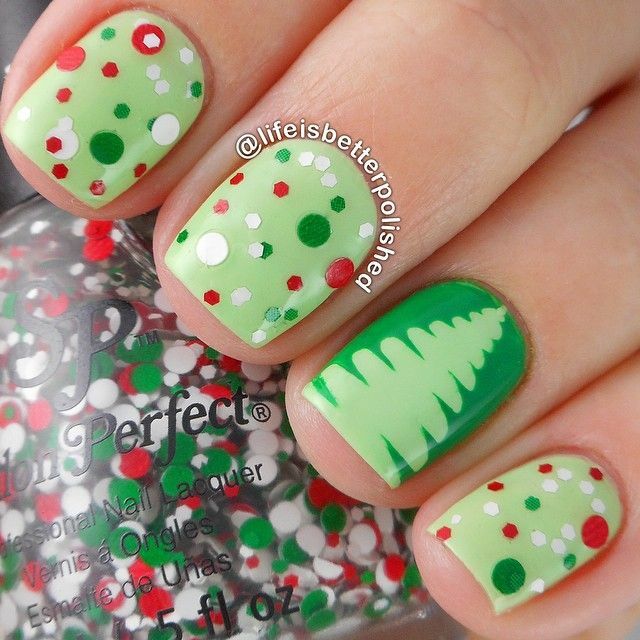 For a cute look, you can paint a cartoon christmas tree on one of your nails and let the others decorated with colorful dots. 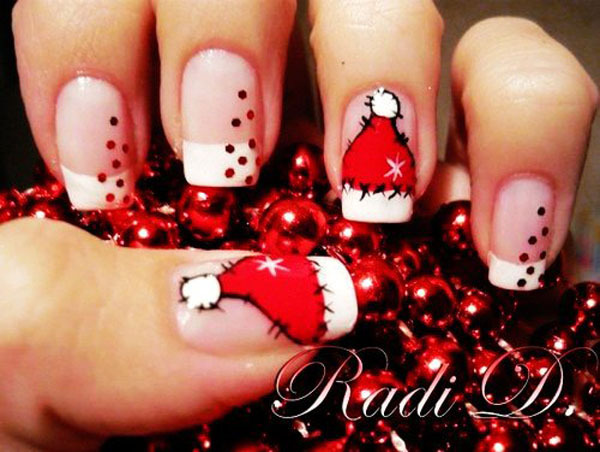 This Christmas nail design is more suitable for younger girls. 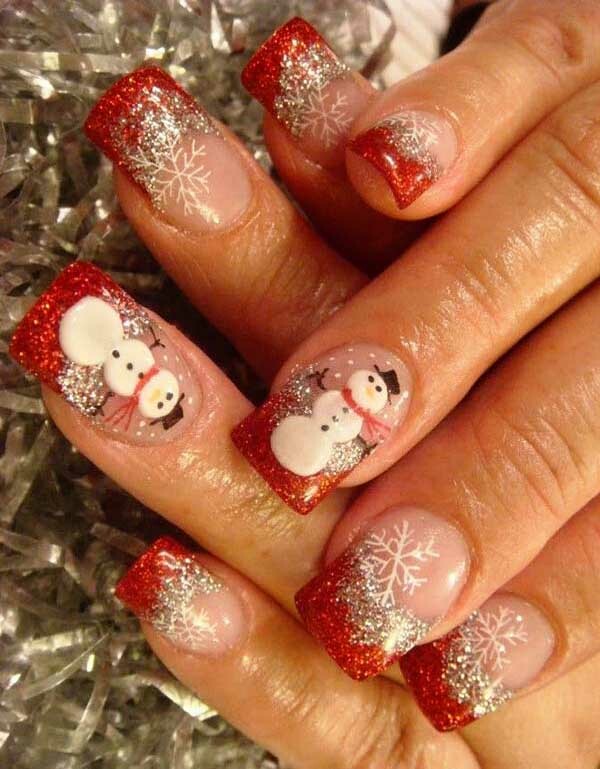 Here is another fabulous nail design for Christmas. The dark blue background reminds us of the dark night and the beautiful flakes just like the best romance in this cold season. If you can’t paint such fine flake patterns in the previous picture, you can rock a flake nail design in this way. It’s much easier to make. 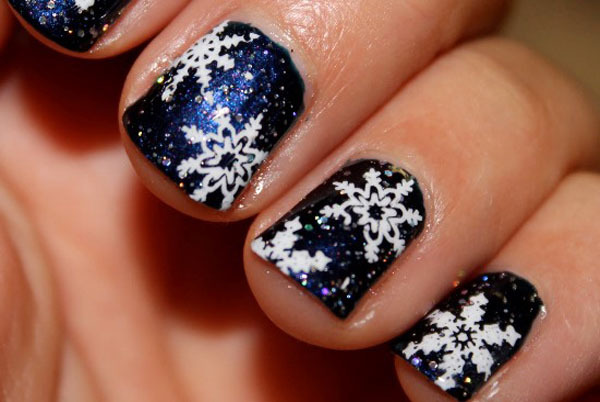 You can try the silver nails which represent the snowy winter for Christmas. 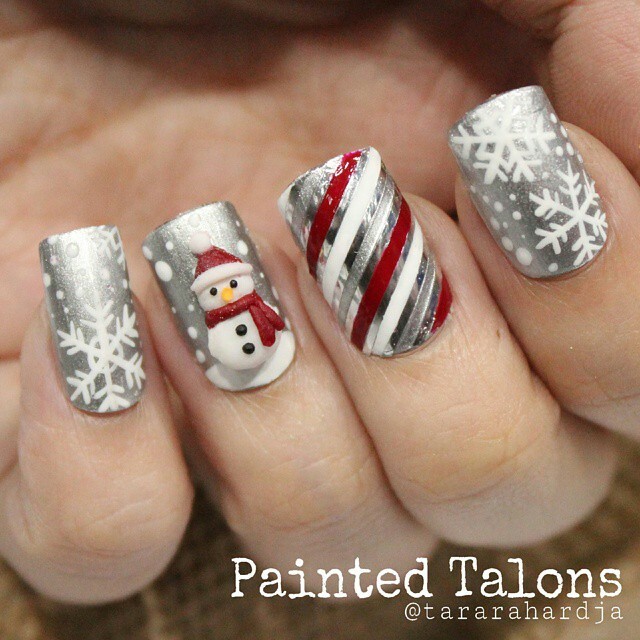 The snowman and diagonal stripes make this chic nail design more interesting. 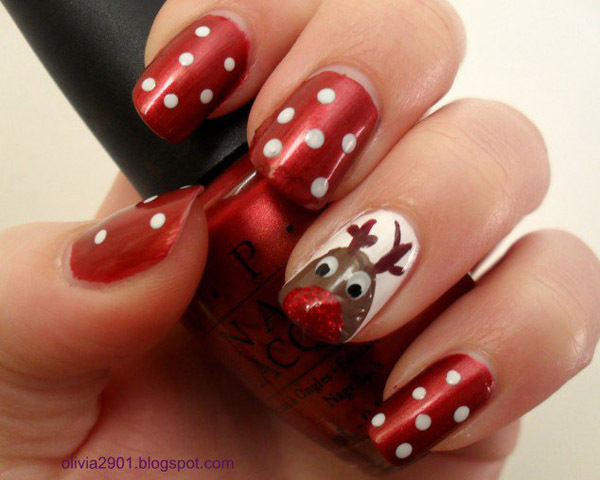 Perhaps nothing is better than painting the Santa Claus on your nails on Christmas. 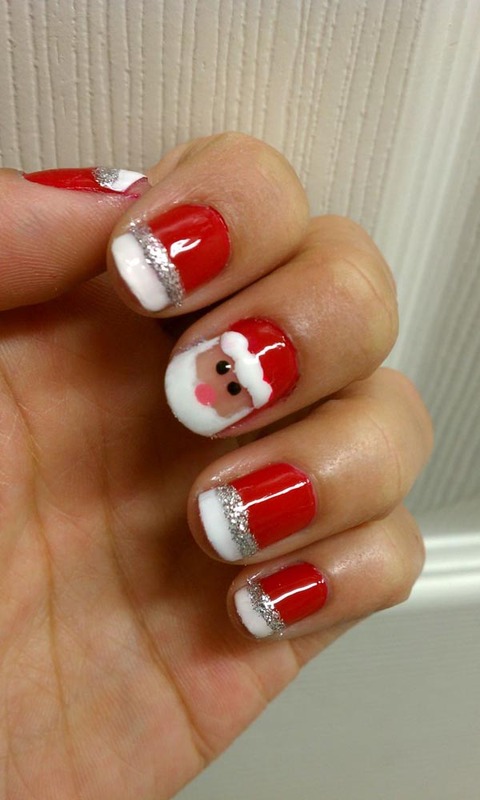 This lovely Santa Claus nail design is rather festive and simple for all women to try. Or, you can just focus on one part of the Santa Claus. 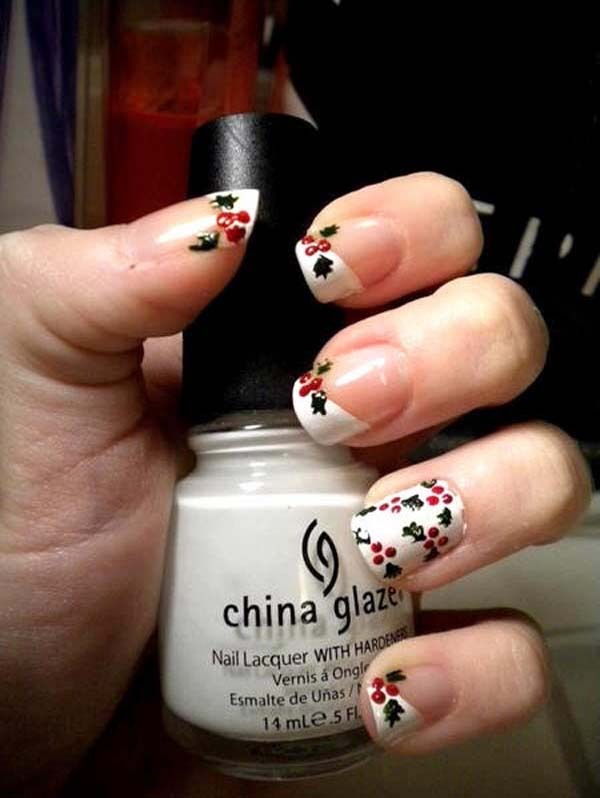 For example, make a cartoon Christmas nail design with the cute Christmas caps. 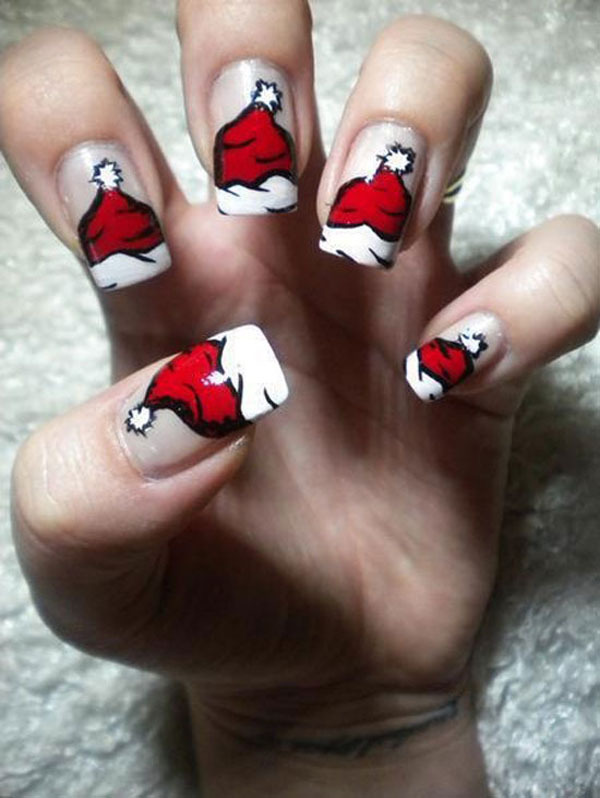 This is another Christmas Cap nail design. It’s quite splendid and will save your time as you don’t need to paint so many hats. 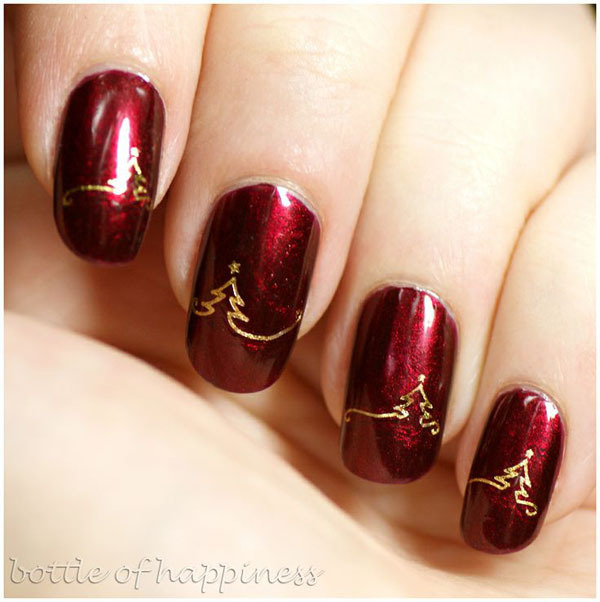 This Christmas nail design looks very expensive with the crimson underpainting and the golden abstract Christmas trees. It’s not complicate and you can try to do it on your own. Just take more practice. If you are not very skilled at painting, this stylish nail design may be hard for you. But if you like it, you can show the picture to the nail artist and she will help you. Compared to the above one, this elf and dotted nail design is much easier and it’s equally stylish. 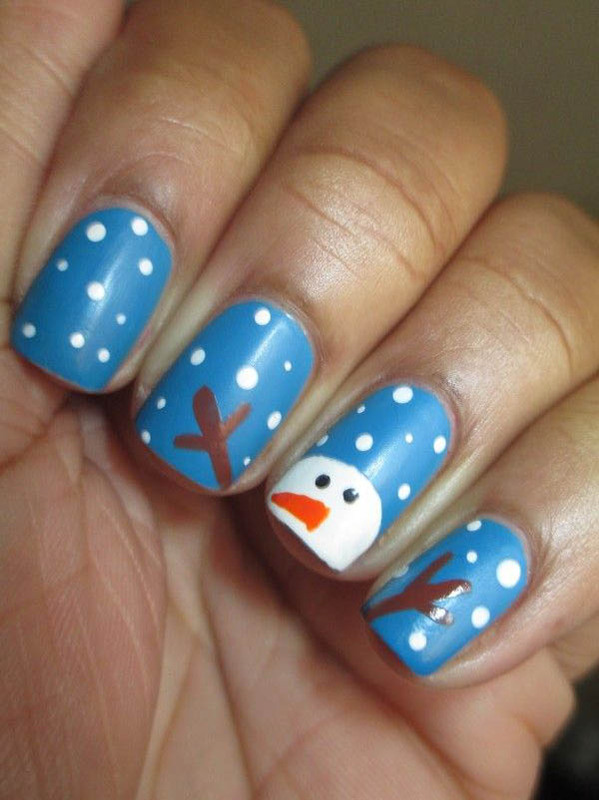 Why not just enjoy a happy Christmas day with this interesting nail design? 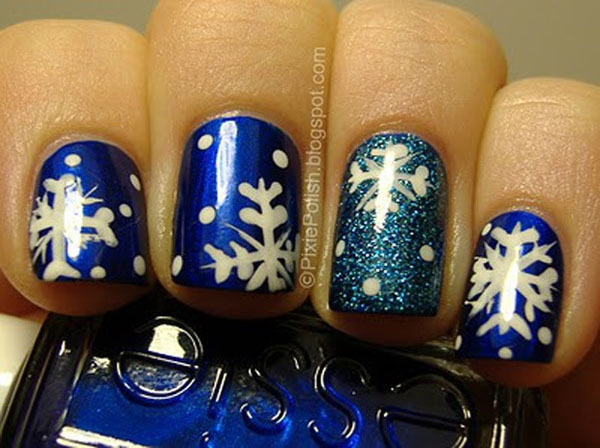 If you like blue, this frozen style nail design will be your favorite choice. 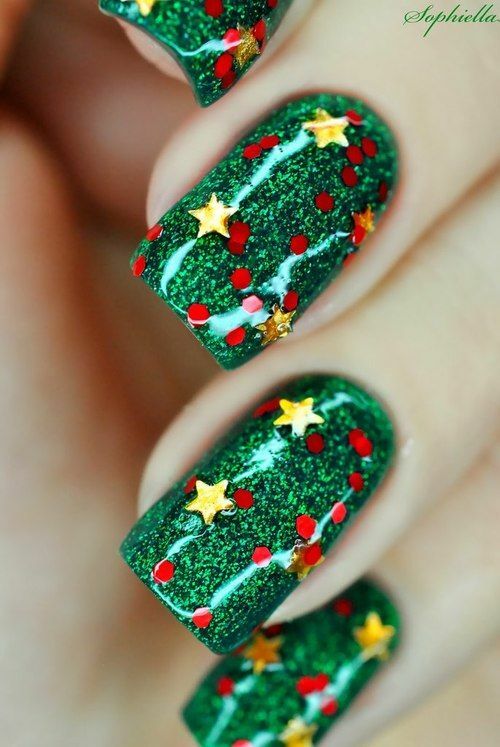 If you are patient and want your nails to look more exquistie, just take you time and experiment with this stunning Christmas nail design. But if you are a beginner, don’t lose heart! You can have this alternate. 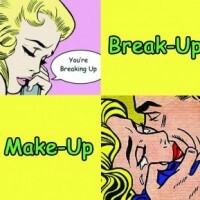 It’s quite simple yet rather cute, isn’t it? The glittering and translucent nails are quite stylish for Christmas. 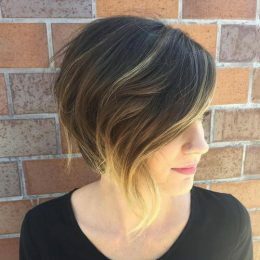 It’s a very beautiful for younger women to try. The white background is great for you to paint some simple patterns. 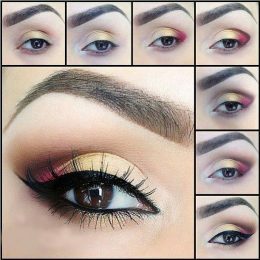 This is not difficult but it’s just fashionable without any effort. For beginners, perhaps nothing is easier than this one. Although this nail design looks simple, it is quite stylish at the same time. This is a cute nail design which is not difficult as well. Since there is still some time before Christmas arrives, you can take your time and practice more. Thus, you can rock this cute nail design on that day. The Christmas trees of different sizes make each of them like a great picture. It’s an ideal nail design for women who prefer simple nail designs. You can succeed the first time you try this nail design, for it’s not so complicate as it seems. If you like it, just go for it.